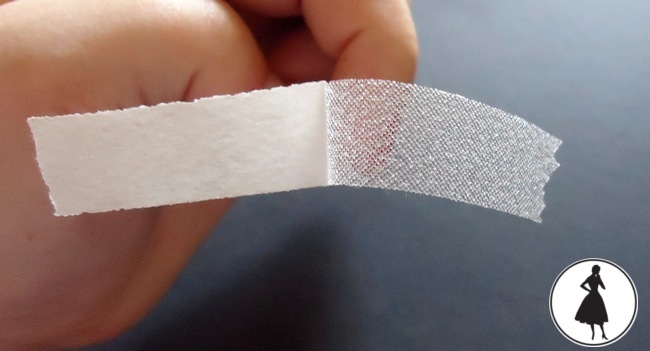 Recently during the Tiramisu Circus, I mentioned one of my favorite sewing friends: fusible webbing tape. It helps tame knit hems (or any narrow hems, really), and can replace pinning or basting for many sewing applications. Generally, I find taping yields much cleaner results than pinning and it’s quicker than basting. Since writing the Circus posts, I’ve had several emails from readers who have purchased Steam a Seam but had a few questions about its use. I’ve used it in my own sewing for years with few issues. In fact, it’s quite painless. I thought I’d go through the ways I use this stuff, and open up the floor for you all the share other uses. 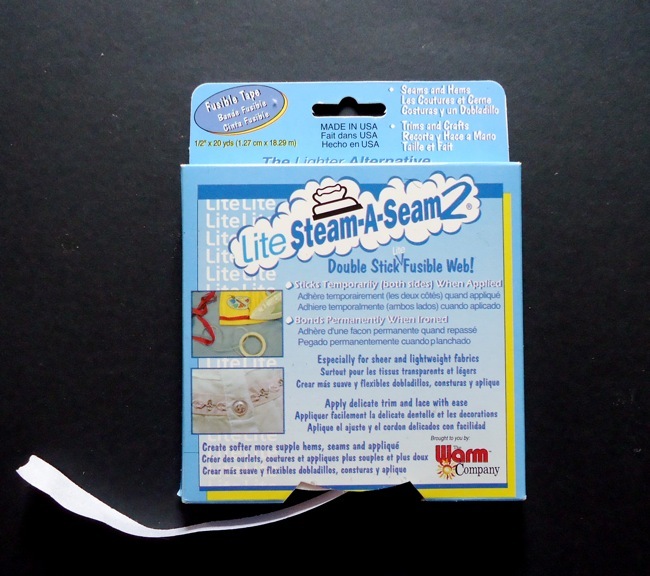 I use Steam A Seam Lite 1/2″ (1.2cm) wide tape that comes in 20 yard rolls. It’s also available in 1/4″ widths. I prefer to use the term “fusible webbing tape” because I don’t want to continuously plug one company over others on the market- Thermoweb, Heat n’ Bond, etc. Besides, nothing will prevent an intrepid sewist buying a sheet of Vliesofix, Wonder Under, Applique Wonder or any fusible webbing suitable for applique work and cutting it into narrow strips for use in apparel sewing. Whatever works! It has a “temporary” fix option and a permanent fix option. I’m not sure how many other fusible webbings perform that way. I know from continual use on a wide variety of fabrics that it will not add bulk to seams or hems. I have also never noticed Steam a Seam residue after washing and wearing the garment. The 1/2″ width is useful on seams and hems with a 1/2″-5/8″ allowance. No measuring! 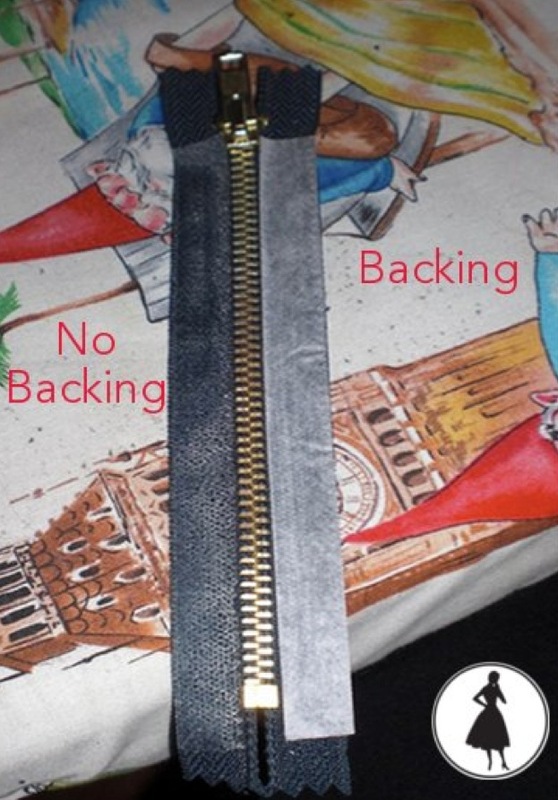 Fusible webbing tape can help position zippers, pockets, and other design details without pinning. This is great news for heavy/bulky or lightweight fabrics in particular. 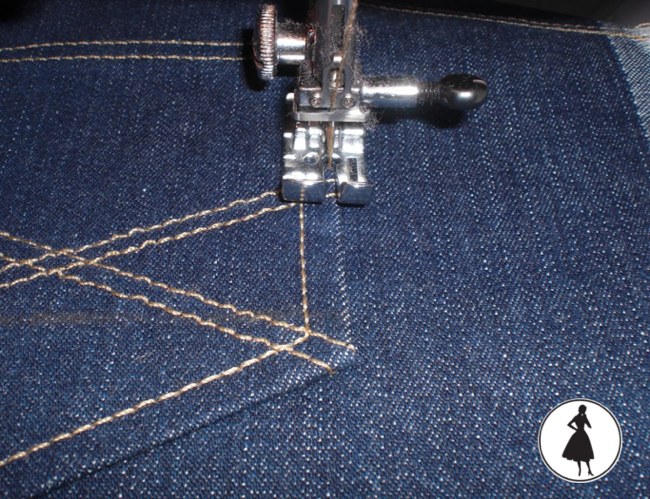 I used to find that pinning pocket on jeans especially creates a “bend” in the fabric, and can be difficult to stitch neatly. The webbing rolls out of the box with one papered side and one tacky side. The tacky side should adhere to the fabric. This is the part with limitless variability- it may or may not stick very well to your fabric without steam pressing. I recommend adhering the webbing to the fashion fabric with the iron before removing the paper. This way, one side of the webbing is already attached to one piece of fabric. 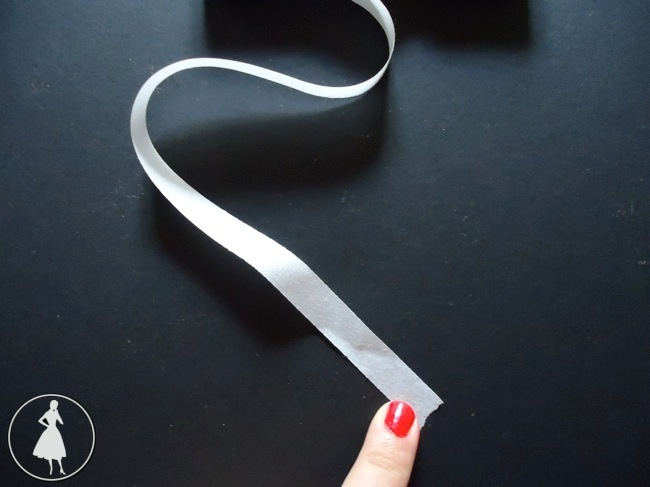 If it’s not pressed in place, odds are the tape will stick to your fingers, to other bits of fabric, to the iron, to itself- everywhere except where you’d like it to stick. Once one side is adhered, remove the tape. Now it’s “post-it note” sticky. 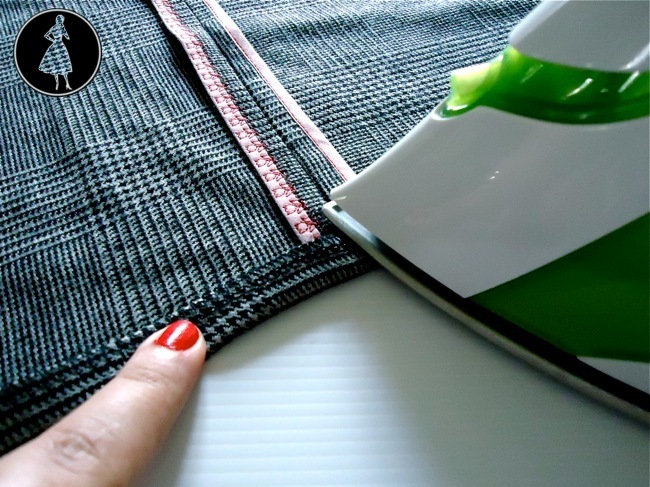 You can re-position pockets and other design features, or gently and carefully “finesse” a seam into position. Once the seam/hem/pocket is in position, just apply heat and a little steam to set the webbing. Then stitch. It’s essential to stitch. Not just because I think that’s proper, but because my experiments show me that on most fabrics, the webbing does not adhere to the fabric through washing. It must be stitched in place. Far and away, this is the cleanest and least difficult method I’ve found for ensuring a tidy pressed edge on patch pockets as well as enabling easy stitching. 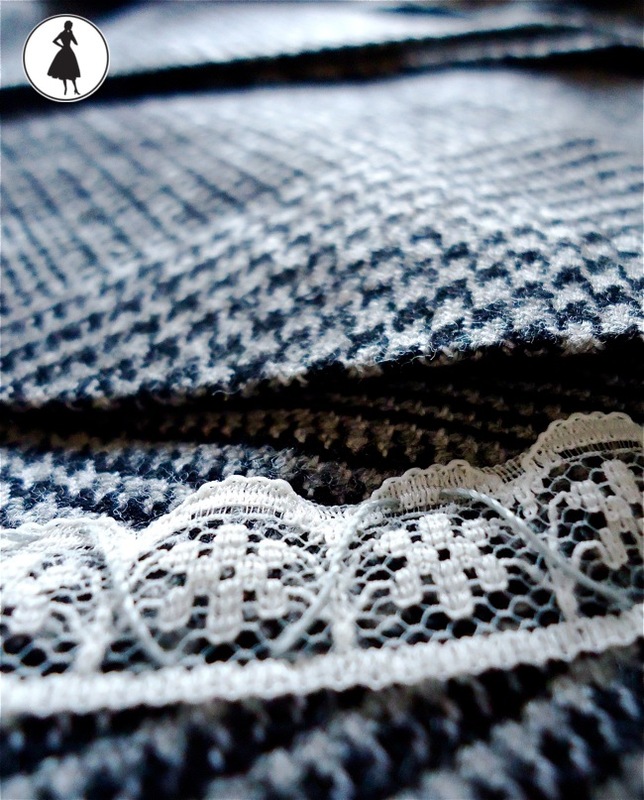 Some bulky or heavy or tightly-woven fabrics (like denim) resist easy pressing. I like to use lots of steam, pressure, and a clapper to achieve a sharply pressed edge, but sometimes that won’t cut the mustard. 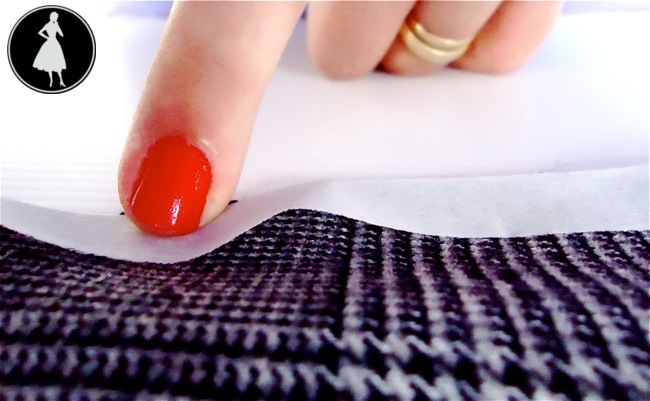 Even then, once an edge is pressed under, it can be tricky to keep the raw edges tucked, position the pocket properly, and hold it in place long enough to be stitched beautifully. If I slap a little fusible webbing to the wrong side raw edges and press those edges under, I get sharp pressed edges and the pocket is easier to handle. 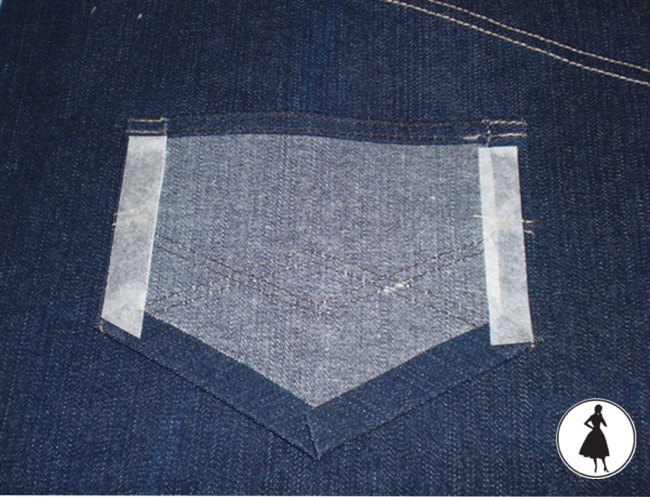 Then a little more webbing on the back of the pocket enables easy positioning of the pocket. If you’ve been sewing for a while and all that sounds “no sweat” to you, remember our Sewing Newbie sisters and brothers. It’s tough to manage these feats of dexterity simultaneously when you’re just starting out. I see the use of fusible webbing in this case as the gentlest pathway to pocket-sewing success. When you’re first learning, it’s easy to feel like you stink at sewing, and a “win” like beautiful pocket stitching is incredibly satisfying. These kinds of wins mean Newbies will keep sewing, and the more people who sew the better. 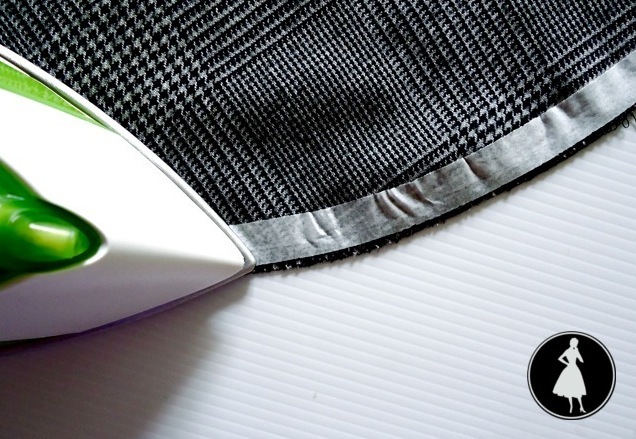 Not to mention, use of fusible webbing on stretch fabrics can prevent rippling. Yeeeeears ago, I tried Debbie Cook’s fly zipper tutorial and never stitched another fly differently. I use her excellent method for every fly I insert, and I have taught dozens upon dozens of other sewists to do the same. How can I improve on perfection? It’s not possible. Debbie Cook’s tutorial is notable for the use of fusible webbing tape to position the zipper for optimal stitching and kicked off my interest in finding other fusible webbing applications. It was so simple! So effective! Such attainable good results for my beginners! Lately, I’ve been using fusible webbing to tame curved hems on fabrics of many descriptions- from wiggly hemp-rayon for The Christmas Island Dress to drapey wool suiting. At first, I didn’t think I could “bend” the tape to my will. After all, it’s backed with paper and paper isn’t terribly bendy. However, I discovered that as long as I keep the fabric completely flat on the ironing board and move slowly around the curves, I can indeed persuade the paper to “pucker.” This means I can apply the tape in one continuous length. The tape beneath the puckered paper adheres to the fabric normally. Then I fold it up and stitch the hem in place. I find this works with a wide range of hemming treatments. Usually, I will finish the raw edge of the hem after Stephen levels it off for me. Then I apply the tape, fold up the hem and sew it in place with a topstitch. However, in the case of this drapey wool suiting circle skirt I recently hemmed, I wanted a fancier inside hem. I finished the edge and applied the tape as usual, folding up the hem and pressing to secure the webbing. Then I catch-stitched the hem by hand with a bit of lace on the back to cover the overlocking. It’s pleasant “TV-watching” work and it’s pretty. This skirt is going to a certain Duchess of the Textiles* who understands about wool care, so I know this skirt won’t ever find itself rammed into a washing load of jeans. I left a little slack on the thread, to allow the hem to “breathe.” This way, as the fibers settle into place through wear and pressing, the stitches won’t create weird puckers in the hem. I finished this hem earlier this week and it’s been out on my work table. Every time I pass, I can’t help but admire it a little. The fusible webbing doesn’t bulk up the hem or add any stiffness, which is great because I selected this fabric for that Duchess in part for its fluidity. In general, I don’t like sewing techniques that alter or work against the character of the fabric. This doesn’t! My only complaint is the sticky residue left of my fingertips after taping an entire circle skirt, but it washes off easily with soap and water. From what I can tell over several years of sewing, fusible webbing doesn’t seem to ruin the sewing machine (gummy needles aren’t a problem, for example) or the fabric. I would highly recommend testing fusible webbing on your desired fabric before using it on an entire garment if you’re unsure how the fabric will behave. That’s always safest. I’m fairly certain it could, but I just can’t make that claim. I’m not saying that fusible webbing strips completely replace pins or basting, but I do think it’s a useful addition to any sewist’s worktable. 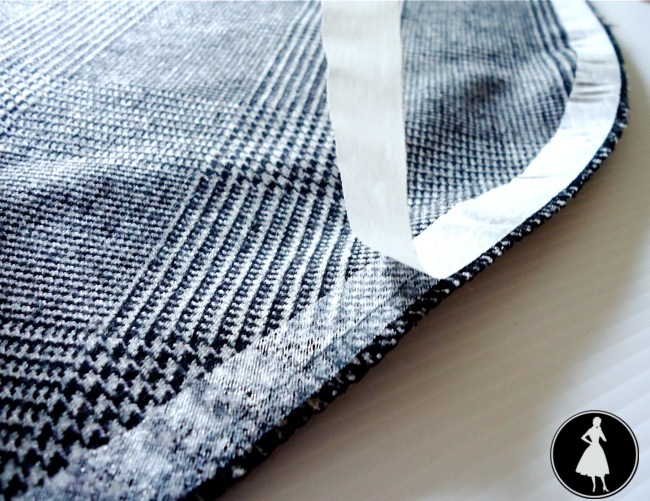 It allows clean, ripple-free hemming on a wide variety of fabrics. This is especially useful on jerseys, which are notorious for undesirable rippling during sewing. The rippling might not matter on a side seam where it will be stretched, but it’s a problem for hemming. 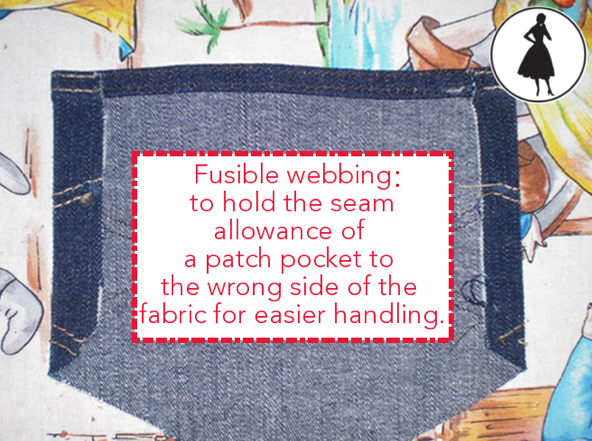 Fusible webbing also facilitates simpler sewing of a wide variety of “tricky” seams. It takes a little work to set up, but it’s worth it in painless, pretty sewing. I’m curious how many who are reading this use fusible webbing in their apparel sewing? What other ways do you use fusible webbing tape? Do you have other lingering questions I missed? Let me know! Next up- my felted wool shoulder bag. While I was working on this, I found myself completely sidetracked into the whimsical world of felt embellishments. This ties in well with some of the “zero-waste Holiday” ideas I wanted to play with later this month! Rad! 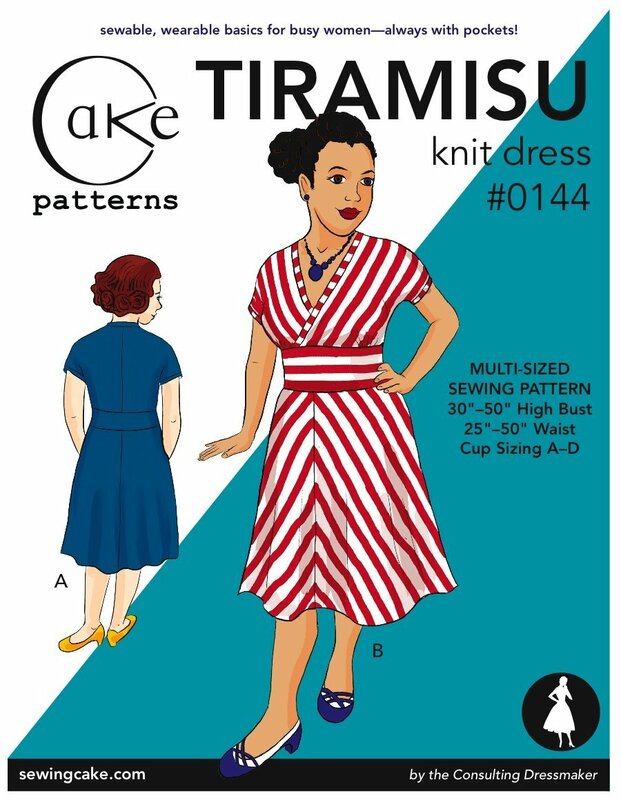 Also- still no firm date on shipping for the Tiramisu sewing pattern (looks like Monday or Tuesday! ), but as soon as I know something definite, I’ll be sending an email to the list and probably shouting “YIPPEEEE” all over Twitter, Facebook and etc. *a little bit of a project in the works for your delight and enjoyment early next year! This entry was posted in Drafting, Couture and Tailoring Projects. Bookmark the permalink. :) I hope you have fun playing with it! I bought mine via Amazon. Hope this helps. Got two rolls of 1/4″ for £11 on eBay inc p&p which seems a reasonable price to me?! Ooooh could you email me the link? That’s a great price. Cracking post, as always. I’ve used this once or twice and absolutely love it. Great stuff and really does make a difference when hemming. Hadn’t thought of it for positioning pockets and zips though. Guess I’ll be using this technique in the future. It’s shocking how much fun we have with our hobbies. And I get to play with power tools when I’m doing home dec projects. Fun, fun, fun…. I mostly use this for zips, especially long ones. Recently I had to replace 3 invisible zips in trousers. The seam edge of the fabric had frayed considerably from removing the zip so I used Stea a Seam to hold the seam in place making it much easier to sew. Hadn’t thought of using it on pockets though. Wow, this post is packed with great information! One of my goals is to make the insides of my garments as clean and finished as the outsides. I’m definitely going to try using the webbing with lace trim to hem. You’ll love it… Didn’t take too long, maybe an hour or so. Very relaxing… :) And so pretty. They should pay you for this advertising! I want to run out now and buy some. Really good info Steph. Hahaha… I suppose… It’s less the brand than the concept, really… :) Thanks. I just bought steam-a-seam and I printed your instructions for extra help. 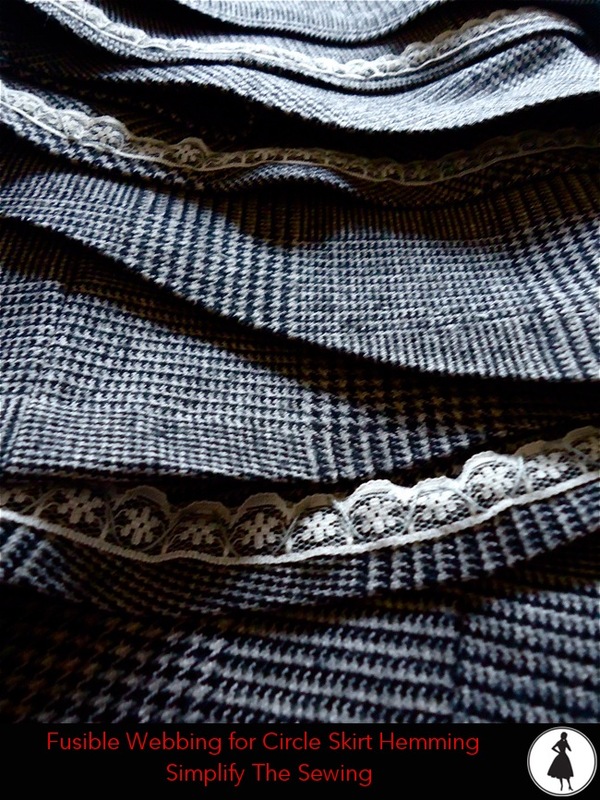 The taming of a knit hem sounds wonderful. I’ve seen this stuff in the fabric shops ( I live near a fabric district) and I’ve wondered what it is. I will pick some up next time I see it! Thanks for the tips! I’ve been looking for steam-a-seam, but so far I have not found it here in NY. (Can get any professional thing in the NYC, but “home” dressmaker supplies are much harder to come by!) I did use an alternate type on a tissue jersey hem recently, and it turned out quite nicely. I think it was Stitch Witchery, but I’m not sure because I’ve had it in my supplies for about 10 years. I like the stick-on option of S-a-S, so I’ll keep looking around before resorting to the web (dreaded shipping charges). I have used another also, a washaway 2-sided tape. It can get a bit gummy and I would not use it on large areas, but I found it really usefully for making underwear. (Using the narrowest width). The one thing that slightly concerns me about these products is whatever chemicals and substances they are made out of. I’d like to have a little more info about that. Stitch Wichery… That sounds like another one. There’s heaps of brands. Wonder Tape was the one I couldn’t think of. I don’t think I’ll stop using them either, but I’d still like to know what’s in there! I recently bought some and tried to use it as a short cut with my Halloween costume but I found curves tricky and gave up. But, that is more about my impatience at the time, I’m glad to read a few tips on how to make it work with me in the future. I use this all the time for exactly what you have outlined. Plus anything else I want temporarily positioned while I sew. For example my sorbetto top (free Colette pattern) had the bias binding strips down the front stuck on through a couple of washes while I decided whether I liked it as a trim. I’ve now hand sewn it on, but it lasted long enough for a trial run. I get my steam a seam at Spotlight (Aussie store!) but it is in the quilting section. I don’t quilt so I’m not sure what quilters use this for but maybe some online quilting shops sell it? Also, there is ordinary steam a seam which is heavier than steam a seam lite. It also works the same way but I like the ‘lite’ version better especially for hems as it is less stiff. I recently started using something similar, but specifically for knits, and I can’t believe how much easier it is to turn edges under and stitch down. I need to try the Steam-a-seam too. Gee, I feel so dull. I am a traditionalist and still hand baste everything. But it works and I love the process of hand stitching and feeling the connection with the fabric. But maybe one day …. Funny – I stock the wide Steam a seam, it’s around 60cm wide I think, and it is my fave due to that tacky thing. But I’ve not seen it in a strip form. The only strips we can get are Clover’s one for making fusible bias tape, which is only 5mm wide, and a 1 inch wide hemming web. I must put the thumbscrews on some of our distributors and see if we can get it in. It would be nice not to have to cut the strips by hand! Ah, yes, the sheets. I keep a little stock of that around here, comes in handy for so many things… The strips are niiiiice. Definitely put the screws on your suppliers, and don’t let them rip you off for pricing. You may perhaps find that you can almost buy it for the same price retail from the US as you can wholesale from your suppliers.. I’ve been staunchly buying my SaS from a local indie, it’s three times as expensive as Amazon pricing… Which is weird, there’s some kind of antipodean supply chain issue or something…? Wow, Steph, that’s a pretty comprehensive look at fusible tape. I love steam-a-seam too. I hadn’t thought to use it in seam allowances–that’s brilliant. It really can make some nasty jobs much much easier. This looks like magic to me. I think I may need to invest in some STAT. I had no idea what exactly it was or how it worked until now. This post is fabulous!!! Thank you, dear! Hehe, close to magic… Close… I don’t think it’s much of an investment, maybe $5-6 for a 20yard roll? Sounds good to me… :) No problem! Love this stuff. Didn’t know to use it on knit hems though. Next project I will give it a go! I think you will be pleasantly surprised. :) It really, really tames those knit hems. I haven’t used any of the fusible tapes you mention, but for some of these tasks I just use glue (either white glue or glue stick, mostly depending on my mood). I find it really useful for keeping patches attached to jeans long enough for me to sew them into place. I get scratched up when I use pins for this, and the fabric tends to still shift a lot. Putting on patch pockets is a similar task. Anyway, I just mention it mostly as a poor man’s fusible tape, as it doesn’t seem to do as many tricks. I discovered Roxanne’s Glue-Baste-It a couple of years ago when doing a little sundress for my granddaughter. The thing has rickrack in all the edges- a tiny drop of the glue kept them positioned for the hem to be stitched. The glue washes out easily, even in cold water. Since then, I’ve used it for positioning pockets, curved armscye treatments, tacking lace to an edge before hand-whipping it down. I suspect any white School Glue would work- it’s the teensy little hypodermic style applicator tip that makes this brilliant. Great tips! Thanks, lady! I was just reading a glowing recommendation of Steam-A-Seam over on Goodbye, Valentino. Now I really need to try it! Thank you thank you! Very useful. Gotta get me some of this now. Pingback: 30 Minutes A Day Tiramisu Knit Dress Sewalong! I was thinking of using Steam-a-Seam to help line up my stripes before stitching while making my Tiramisu. I spent such a long time making sure I cut out the fabric precisely I really don’t want the fabric to slightly shift while stitching and negate all my hard work. Do you think it would be OK to use on the seams where the stripes need to match up? Any advice or things to be aware of before I do this? Or, any better ideas? Good thinking, Melanie, and you’re getting ahead of me on the sewalong! I’ll dive into that on day 4 I believe, but yes, your instincts are correct. sorry! I am so excited about the sewalong. Also, I don’t currently have any fusible webbing, so I’ll need to make a jaunt to the store. I wanted to make sure I have plenty of time. Hi, thanks so much for the details on use of fusible webbing material. I am interested to use it to mend tears in my silk garments. Would it work? And how would I use it? Would I still need to stitch the torn edges together?